This programme, put together to highlight some of the different trends in Swiss and German church music in the mid to late 19th century groups together four rare musicians who attempted to revive the great Baroque tradition and reconcile it with the new harmonic and expressive style of romanticism. Forchhammer and Jucker hail from Switzerland while Kirchner and Rheinberger are of German descent. The latter, born in 1839 under the name of Josef Gabriel was a wonder kid being appointed parish church organist in Vaduz at the age of 7. In due course, he became organ professor at the Munich Conservatoire and director of church music at the Bavarian Court. He wrote profusely in practically every genre, but is best remembered for his large organ output. His choral music is also occasionally revived. From the 18 or so masses that he wrote, this recording includes the 1889 Mass in F Major, a lyrical and romantic piece in which the composer achieves both his intensions of clarity and simple technique. Theophil Forchhammer (1847-1923) is nowadays practically forgotten, but in his heyday he was a very important and influential composer. His family were artists and scholars, so it is no wonder that by the age of 20, he became organist in Thalwil. For nearly 20 years, he travelled through a number of Swiss and German cities before being appointed organist at Magdeburg Cathedral in 1886 where he remained till the end of his life. A brilliant improviser and virtuoso, his music finds its basis on that of J.S. Bach and Liszt. The Organ Sonata #2 (for a burial ceremony) is an imposing work based on church chorales, but interspersed with moments of extreme romantic fervour. Neo-baroque passages are also integrated into a wide-ranging stylistic sound world. The 8 choral settings Op. 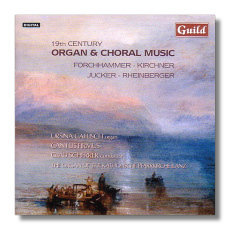 11 (for church use) combine traditional melodies with modern harmony, and were among Forchammer's most admired works and in this recording we hear #2 and 3. Theodor Kirchner (1823-1903) was a prodigy, giving his first organ recitals at the age of 8. In 1843, on Mendelssohn's recommendation, he was given the position of organist in Wintherthur, thus marking the beginning of a 30 year story in Switzerland. He was a compulsive gambler and very often had to be assisted by his colleagues who nonetheless respected him to a high degree. His precocious talent was also very much admired by Mendelssohn, the Schumann's, Brahms and even Grieg. He never composed orchestral works and his chamber output is very lean, on the other hand, apart from his many organ works, he wrote over a thousand short piano pieces and several songs. This CD includes seven pieces from his 'Organ Compositions', Op. 89, published in Leipzig in 1890. Although these are brief compositions, they are full of contrasting moods. Lyricism and grandeur are balanced by gentleness and meditation. In places, a hint of restlessness is also discernible. Benedict Jucker (1811-1876) was a student of Johann Rinck and succeeded him as organist at the Basle Cathedral in 1846. The 9 Choral Preludes Op. 7 were composed in 1867 and were dedicated to Johann Topfer, his composer friend, who was also an organist and organ builder. This album incorporates only #2, 7 and 8 but there is enough material here to help us appreciate the polyphonic strength and chromatic element of these pieces. Ursina Caflisch draws some truly eloquent sounds from the Ilanz organ which though relatively young, is an instrument of incomparable celestial beauty. In the Rheinberger Mass, Cantus Firmus under Clau Scherrer sing with confidence and exuberance, oozing out all the lyrical beauties of this short, but inspired piece. An excellently recorded disc deserving much more than a passing whiff.